The Diocese of Parramatta has announced plans for a major project around the St Patrick’s Cathedral precinct that will revitalise and renew the northern end of the Parramatta business district, Parramatta Sun reports. The project, known as St Patrick’s Quarter, will provide more opportunities for Catholic services including pastoral outreach, education, and community support within the Diocese of Parramatta, which includes Western Sydney and as far the Blue Mountains. With the population of Parramatta projected to grow over the next 10 years, the Church is committed to using its presence in the Parramatta CBD to do more and be more for the local community. 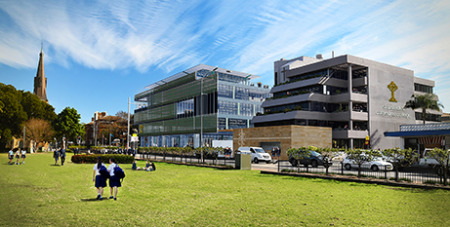 St Patrick’s Quarter will include a new CBD school to be known as St Patrick’s Cathedral College. The new school will eventually cater for local primary and secondary students and is scheduled to open in 2020. To meet the needs of local families, the new school will operate from 6am-6pm and include a preschool and out-of-school-hours-care facilities. A new Church administration building, to be located next to St Patrick’s Cathedral on a currently unused section of St Patrick’s Cathedral grounds, will also be a component of the reimagined precinct. The administration building will accommodate staff from the various Catholic agencies and ministries. A modest commercial/residential hub on the corner of O’Connell Street and Victoria Road will also be part of the project. Diocese of Parramatta Bishop Vincent Long OFM Conv. said that St Patrick’s Quarter will energise the area and ensure that the Church in Parramatta will continue to provide services and support to local families and the most disadvantaged and vulnerable in the community. “The Catholic Church has a proud history of contributing to the Parramatta community going back almost 200 years,” Bishop Long said.